One of the ways the University of Regina Students’ Union (URSU) helps their members excel in their educational pursuits is through its Project, Event, or Conference (PEC) Funding. This funding allows students to receive partial funding to complete a project, put on an event, or attend a conference specific to their faculty. “My research was extremely well received at the annual Global History International Student Conference hosted jointly by the Freie Universitat and Humboldt University of Berlin,” said Kleisinger. 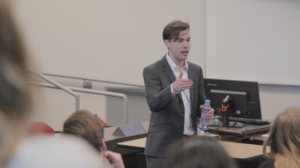 As the only undergraduate presenter in a conference geared towards graduate-level research, he received both constructive and encouraging feedback during the question period, as well as numerous requests for a copy of his formal essay once the presentation had finished. All URSU members that are in good standing are able to request funding from the URSU’s Project, Event and Conference funding line item. Graduate students are not eligible for funding from URSU. If you have a project, event, or conference coming up and would like to know if you can apply for PEC Funding please email the URSU VP Operations and Finance at vpof@ursu.ca or visit vibe.ursu.ca and fill out the PEC Funding form.